*** INTRO PRICE – £12.95! 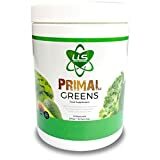 *** LLS NEW PRIMAL GREENS BLEND – A Natural Combination of Nutrient Dense Green “Superfoods”. NEW Unflavoured Version – As a Response to Customer Feedback. Perfect for Those Looking to CONVENIENTLY INCREASE NUTRIENT INTAKE – Great fo Energising, Detoxification, Immune Support, Dietary Fibre, Overall Health and Wellbeing – High in Bioavailable Antioxidants. GLUTEN, DAIRY, SOYA AND WHEAT FREE – Suitable for Vegetarians and Vegans – No Additives, Fillers or Artificial Flavours. CLEAN AND UNFLAVOURED – Natural Flavour with No Sweeteners or Sugars – Perfectly Clean to Add to Your Daily Shake or Smoothie – Produced in the UK under GMP Licence. Primal Greens is a carfully blended, high quality combination of the most nutrient dense green “Superfoods” available. This powdered drink formula can provide an effective and cost effecient way to increase your daily intake these important vegetables, fruits and grasses. Ideal for those wanting to detoxify, energise, improve immune support and overall well being, increase dietary fibre intake and those leading active lifestyles. – Kale – Contains powerful antioxidants like quercetin and kaempferol as well as various flavonoids and polyphenols. – Spirulina – Has powerful antioxidant and anti-inflammatory properties. – Spinach – An excellent source of vitamin K, vitamin A, magnesium, folate, manganese, iron, calcium, vitamin C, vitamin B2, potassium, and vitamin B6. – Broccoli – Contains high levels of compounds called glucosinolates with many health benefits. – Organic Barley Grass – Can strengthen immune system, cleansing and detoxification of the body. – Wheatgrass – An effective healer because of it high mineral content. – Organic Alfalfa – Used for high cholesterol, asthma, osteoarthritis, rheumatoid arthritis and diabetes. – Watermelon Powder – Has significant levels of vitamins A, B6 and C.
Posts related to LLS Primal Greens Powder | 390g Tub / 30 Servings | A Blend of 15 Nutrient Dense Green "Superfoods" | Easily Increase Your Daily Nutrient Intake | Suitable for Vegetarians and Vegans | Unflavoured | Produced in the UK | Love Life Supplements - "Live Healthy. Love Life." This entry was posted in Health Products and tagged 390g, Blend, daily, Dense, Easily, Green, Greens, Healthy, Increase, Intake, LIFE, Live, Love, Nutrient, Powder, Primal, Produced, servings, Suitable, Superfoods, Supplements, Unflavoured, Vegans, Vegetarians by Healthy Senior Lifestyle. Bookmark the permalink.